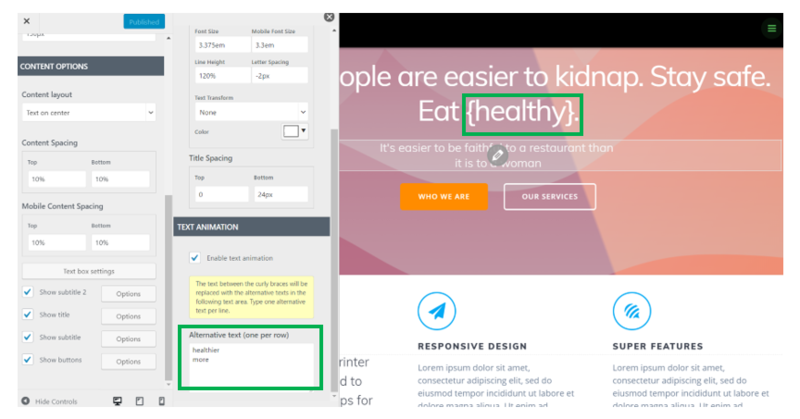 From this section in the customizer, you can set your preferences for the content layout, dimensions, typography and text animations. 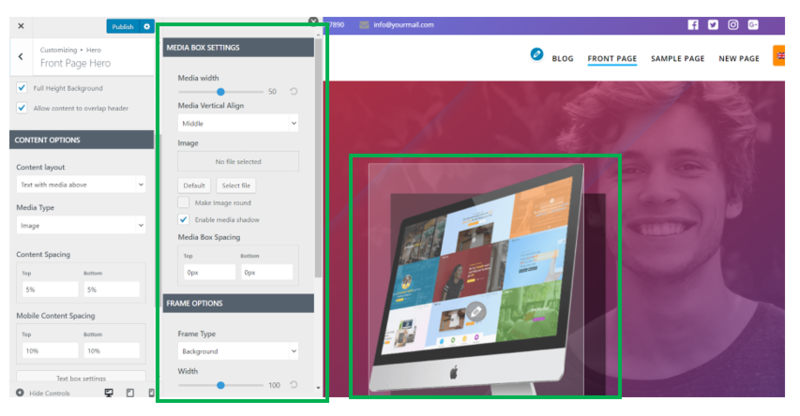 Content Layout (this defines the alignment of the content: to the left, at the center or to the right, text with media on left, text with media on right, text with media above, text with media below). Content Spacing (this defines the distance of the content from the top and to the bottom). Set larger values for a greater distance from the top or/and to the bottom. Mobile Content Spacing (this defines the distance of the content from the top and to the bottom, on mobile devices). Set smaller values for a smaller distance from the top and/or to the bottom. Then test the appearance of the header on tablet and mobile. A motto is a phrase that appears on top of the front page title. Check the checkbox to make the motto section visible in the header content. If you click on Options, a panel will open with the different option fields that you can set to the values you want. From the respective panel, select the motto typography and the motto spacing. Motto Spacing – this defines the distance from the top and to the bottom, for the motto phrase. Check the checkbox, for the title to be visible on the front page hero. Click on Options and open a panel where you can make changes to the style of your front page title. Title Spacing – this defines the distance from the top and to the bottom, for the title. Text Animation – check the checkbox to test some text animations for your front page. A part of the title can be subject to text animations you set from this section. Pick a word/phrase that you want to change to several variants that dynamically show when a user visits the page. Put that word/phrase into curly brackets, in the corresponding editable area of the customizer preview. Hit publish and see the difference. The alternative texts will be succeeding one to another, while the user is visiting the page. Up to now, you probably have a title and a motto. How about inserting a subtitle, too? Mesmerize gives you a supplementary option, dedicated to the subtitle settings. Subtitle Spacing – this defines the distance from the top and to the bottom, for the subtitle. The front page hero comes with the additional option to add buttons in this page section. You can choose to make the buttons visible or not to display them at all. Insert App Store Buttons (you have the store badges for Google Play and Apple Store; you can change the order of the store badges and you have to specify the link to the target page).